Miami-based Norwegian Cruise Line said that it has confirmed an order for a second “Breakaway Plus” cruise ship with German shipbuilder Meyer Werft GMBH of for delivery in spring 2017. Along with the first Breakaway Plus ship, which is scheduled for delivery in October 2015, these two new vessels will be the largest in the line´s fleet at approximately 163,000 gross tons and 4,200 passenger berths each and will be similar in design and innovation to the line´s current Breakaway class, the first of which, Norwegian Breakaway, launched in New York in early May. The combined contract cost of the two Breakaway Plus class ships is approximately EUR 1.4bn. The company said it has export credit financing in place that provides financing for 80% of the contract price. Meyer Werft delivered Norwegian Breakaway, the first of Norwegian´s two new 146,600 gross ton, 4,000-passenger Breakaway class vessels on April 25, 2013; and will deliver Norwegian Getaway, in mid-January 2014. Prior to the Breakaway class ships, Meyer Werft built Norwegian´s four Jewel-class ships Norwegian Gem delivered in 2007, Norwegian Pearl and Norwegian Jade delivered in 2006, and Norwegian Jewel delivered in 2005. These two new Breakaway Plus vessels on order will be the tenth and eleventh that the company will build with the shipyard. 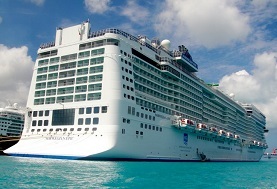 Norwegian Cruise Line took delivery of the 4,000-passenger Norwegian Breakaway on April 25, 2013. Known as New York´s ship, Norwegian Breakaway is the largest vessel to homeport year-round in the city, sailing to Bermuda for the summer.